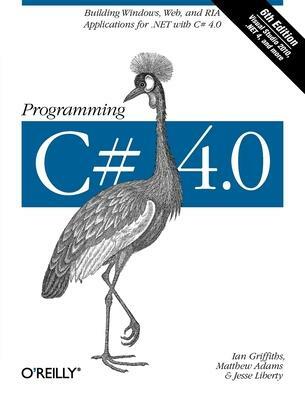 " provides a clear and concise way for programmers to learn C# 4.0 quickly and thoroughly. No prior .NET experience is required for you to get started. Ian Griffiths is an independent WPF consultant, developer, speaker and Pluralsight instructor and a widely recognized expert on the subject. He lives in London but can often be found on various developer mailing lists and newsgroups, where a popular sport is to see who can get him to write the longest email in reply to the shortest possible question. Ian maintains a popular blog at http://www.interact-sw.co.uk/iangblog/ and is co-author of "Windows Forms in a Nutshell" and of "Mastering Visual Studio .NET". Matthew Adams is the Director of Development at Digital Healthcare Ltd. The last three years have kept him fully occupied in the development of a C#/.NET-based distributed imaging platform for healthcare applications. Before that, he studied Natural Sciences at Cambridge University, worked on banking and imaging applications in North America, became a fully paid C++ junkie, and was the lead architect on software solutions for drug-discovery at a large U.S. corporation. He thinks that .NET is a major philosophical stride forward for the computer industry, so much so that he almost doesn't miss his first love--generics--in C#. He has written articles and given papers on the subject to both technical and non-technical audiences and looks forward to the day when he doesn't have to answer the question, 'So, what is .NET?' any more! Jesse Liberty, "Silverlight Geek", is a senior program manager for Microsoft Silverlight in the Silverlight Development Division where he is responsible for the creation of tutorials, videos and other content to facilitate the learning and use of Silverlight. Even before joining Microsoft, Jesse is well known in the industry in part because of his many bestselling books, including O'Reilly Media's Programming .NET 3.5, Programming C# 3.0, Learning ASP.NET with AJAX and the soon to be published Programming Silverlight. He has over two decades experience writing software, consulting and training, with stints as at AT&T as a Distinguished Software Engineer and at Citibank as a Vice President in the Information Division.